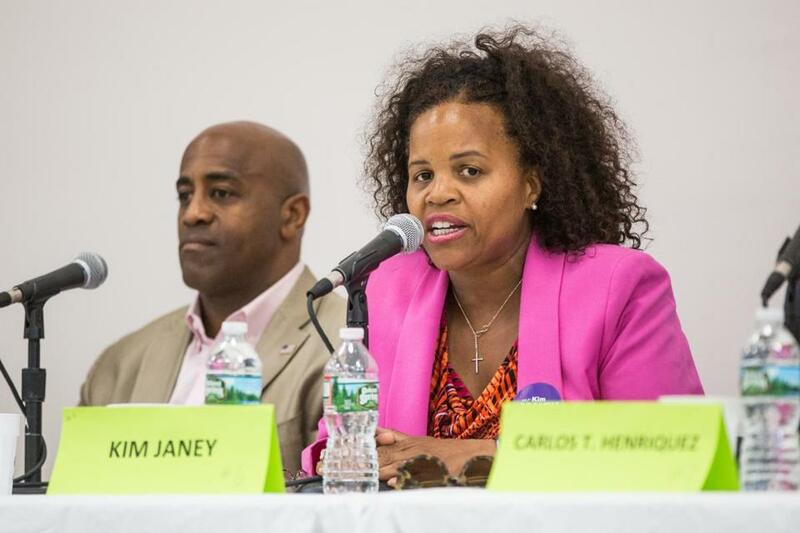 Boston City Councilor Kim Janey is sponsoring a plan to changes the city’s system for providing marijuana licenses, in an effort to support underrepresented owners. Boston officials this week will consider sweeping changes to how the city licenses marijuana businesses, debating a plan by City Councilor Kim Janey to wrest unilateral control of the process from the mayor’s office and give strong preference to companies whose owners were affected by the war on drugs. Janey’s proposed ordinance, made public Monday in advance of the City Council’s Wednesday meeting, would effectively impose a two-year ban on larger marijuana companies backed by outside money. Instead, any company seeking permission to open a marijuana store during that window would have to show that its majority owners belong to three of six groups: those who lived for five of the past 10 years in an area of Massachusetts with disproportionately high rates of arrests for drug crimes; people who have lived in Boston for the past five years; those arrested in the past for marijuana-related offenses, or whose spouses or parents were arrested for marijuana-related offenses; people of black, African-American, Hispanic, or Latino descent; and people whose annual household income is below 400 percent of the federal poverty level. The idea, Janey said, is to acknowledge the disproportionate enforcement of marijuana prohibition against of people of color in the past and create a local pot industry that returns wealth to the city’s disenfranchised communities. While Boston doesn’t impose a hard cap on how many marijuana stores or cultivation facilities can open within its borders, critics say a city rule requiring a half-mile buffer between all licensed pot operations has given a huge advantage to those who can quickly lock up properties in prime areas, essentially granting them small geographic monopolies. Under Janey’s plan, any company that applied to the city before Feb. 1, including several local medical dispensaries that are angling for recreational licenses, could still move forward without meeting the new criteria. After two years, so-called equity applicants would receive twice as many licenses as other firms. Mayor Martin J. Walsh’s office signaled it is open to Janey’s idea. “Ensuring equity throughout our city is one of the top priorities of this administration as the cannabis industry expands in Boston,” Walsh spokeswoman Samantha Ormsby said in a statement. Following months of criticism that his office had set up a complex and opaque process, Walsh in a December op-ed expressed support for changing the process to favor local marijuana companies and creating a fund to help them get off the ground. But Walsh has warned that implementing a local preference program might slow down the licensing process. David Torrisi, executive director of the Commonwealth Dispensary Association, an industry group, echoed that concern. Janey disagreed, saying speed and fairness can coexist. Proponents noted the city’s existing process is hardly speedy — no recreational pot firms have opened so far — and that setting up a clearer, more objective system would boost the pace of approvals and prompt investment in equity firms. Proponents, including state marijuana officials, said Janey’s proposal would boost struggling state efforts to license smaller companies with diverse owners — so far, no certified minority-owned firms have won state marijuana licenses, despite an equity mandate in the state’s marijuana law.